Colonial Queensland Prisoners: Where Were They From? Unlike the glossy, spin-manipulated brochures that pass for government department reports today, annual prison reports used to provide frank warts-and-all assessments of the system. Even better, they were full of massively detailed statistics on thousands of inmates including - among other categories - their ages, occupations, educational background, nationality and religion. Need to know the number of Presbyterians held in Roma Gaol during 1888? It's all in the reports (the answer is 8, by the way). These reports are a mine of data on the population of late-19th-century Queensland (or at least on those people who broke the law), and the nationality tables demonstrate the true multi-racial nature of the colony. Table showing prisoner numbers 1888-97 according to nationality categories in the annual reports for Queensland prisons (C. Dawson). The more detailed tables in the annual reports show regional variances. The prisons near the northern goldfields, for example, were more likely to hold Chinese inmates. The heavy Japanese involvement in the pearl diving industry is also reflected in the northern prison numbers. Unfortunately other Asian residents such as Malays and Filipinos were lumped together in the 'Other Asian' category, but would have still figured prominently in the north. Indians were also a significant minority although many were indentured agricultural labourers and were not permitted to stay in the colony once their work was done. The Queensland Aliens Act 1861 excluded most Asians and Indians from naturalisation and freehold titles, and these groups suffered under restrictive and inequitable workplace laws that resulted in many prison sentences. This period was also the height of the South Sea Islander presence in the central coast sugar plantations and they were the biggest non-white demographic in the prisons during this time, even outnumbering Aboriginal peoples. Most of their crimes were petty, but the imprisonment rate was fuelled by racial paranoia in the sugar areas. The Germans were a significant immigrant group that were allowed to settle and left their mark in Queensland placenames, but despite their relatively free legal status they still made up a large percentage of the prison population. It was a surprise to find the Danes singled out from the 'Other Countries' category and featuring prominently. The poor Danish economy and Queensland government incentives contributed to this, and by the 1890s about half of the Danes living in Australia had entered via Queensland. 18% of all non-British people naturalised in Queensland before 1903 were from Denmark. There are a few curios of the age in the nationality categories, such as 'British America' which referred to the Caribbean states and Canada. It is also clear that a sizeable population of Africans were in the colony at the time. The groups at the top of the table provide no surprises. 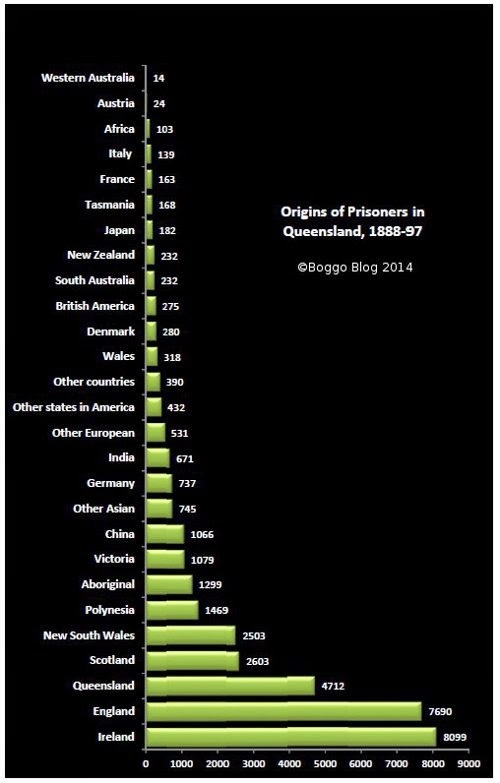 Aborigines had felt the sting of British law since 1788, and the huge numbers of British and Irish immigrants in the 19th century is also well reflected in the prisoner numbers, as was the ever-increasing demographic of native-born Australians. Queensland prisons of the 1880s-'90s were a potpourri of nationalities, a result of proactive mid-century immigration policies and the demands and attractions of specific industries such as sugar and gold. Ethnically-targetted laws resulted in some groups being overrepresented in the prison population where, as will be discussed in a later article here, racial tensions were high and created problems for the prison authorities.